Back in 2009, John La Grou, an electronics innovator, gave a Ted Talk on how to prevent home and office fires with a “smarter type of electrical outlet”. John wanted to look his best. The night before he was to give his Ted Talk, he did a load of laundry. After the wash cycle completed, he threw the load in the dryer and went to bed. Upon rising, he went to the laundry room, opened the dryer door, only to find that his laundry was still as damp as when he had pulled it from the washing machine. He only had a few hours before his presentation. In dismay, he Googled the keywords, dryer won’t heat up. Lacking the time to do any troubleshooting on his own, he called a reputable appliance repair company where he was greeted by a kind and patient customer service representative who asked a few basic questions. The inquiries seem basic but were intended to eliminate oversights that could happen to anyone. Especially when your mind is overloaded with other obligations. When troubleshooting, it is best to start with the most obvious and simple repairs first, working toward the more uncommon and difficult repairs. Does the dryer run at all? If the dryer does not run, have you looked to see if the dryer is plugged in? If the dryer is plugged in but still does not run, have you checked the circuit breaker switch? It is possible for there to have been an overload on the circuitry that tripped a breaker switch. However, if you’re not on a circuit breaker system, have you looked for a blown fuse? Have you checked the selector switch to see if you set it to air dry only? When you open the dryer door, are you met with the distinct scent of mold and mildew? This could indicate poor drainage or some type of moisture leak from previous drying sessions and definitely increases the chances of an electrical short. If the washer is leaking, some of that water could have invaded the dryer and become the source of moisture. Asking these questions may seem redundant but could save John the expense of an unnecessary service call. Let’s assume that John’s dryer runs but does not heat up. There are a few reasons for this to happen and the remainder of this article will focus on two of them. The multimeter is the most important tool in an appliance repair toolkit. Give particular consideration on how to check for continuity. In reference to electrical components, continuity is simply the unbroken flow of electricity from its power source and distributed through the appliance components. A break in continuity in any part of the electrical system would indicate that electrical current is not flowing to that component. The good news is that if you do find a break in continuity you will usually have found the part that needs to be repaired or replaced. Unplug the dryer before beginning any work. Be careful while you work around sharp edges and delicate components. You don’t want to cut yourself and you don’t want to damage another component. The high limit thermostat is actuated by temperature change. It is located behind the back panel and is attached to the heating element. The thermostat must be removed (see below) and tested at room temperature. Testing for continuity will determine if there is an unbroken flow of current. The following guide is for an analog multimeter. Thermostats should show continuity at room temperature and should shut off when heated up. If it doesn’t turn off when heated, the dryer could overheat and increase the chance of a home fire. If the thermostat didn’t test well for continuity, replace it. It’s an inexpensive repair and shouldn’t take longer than 15 minutes to complete. Here’s how to access the thermostat on your Whirlpool Dryer. The thermostat is designed to turn off at high temperature. 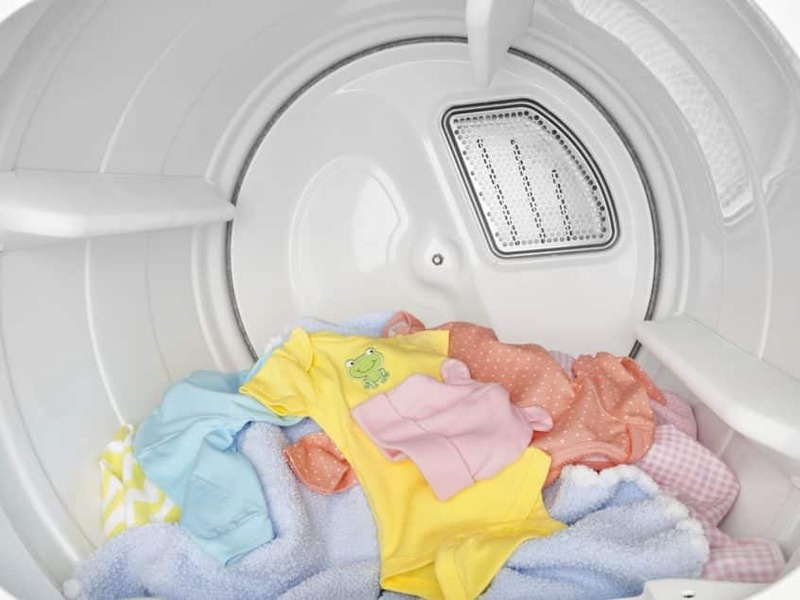 If it doesn’t shut off when heated, the dryer itself could overheat, increasing the chance of a home fire. This is one reason to not throw your clothes in the dryer and then go out to lunch or whatever. Never leave a dryer running while you’re not at home. Now let’s take a look at the thermal fuse. You won’t be able to determine if a thermal fuse has failed by simply looking at it. It must be removed and tested for continuity. Oftentimes a failed thermal fuse is caused by a clogged venting system. Ensure the venting system is free of lint and any other material that may have inadvertently become lodged inside. It is recommended that you check the venting system after you change the thermal fuse. To inspect the dryer vents, turn the dryer on and inspect the vent flap to see if it opens when the air is being pushed through the system. If it opens you’re good to go. If not, that means that something is preventing the air flow to escape. Dryer venting systems should be inspected annually. We have yet to discuss some of the more difficult repairs that could solve your dryer heating problems. If this simple repair tutorial does not fix your dyer, or if you need a part contact us for more information.